Sri Lanka’s flagship real estate event of the year, the Lanka Property Show 2019 will return for the 4th successive instalment, which will be held. on 9th and 10th February at the Kingsbury Hotel’s Balmoral Hall. 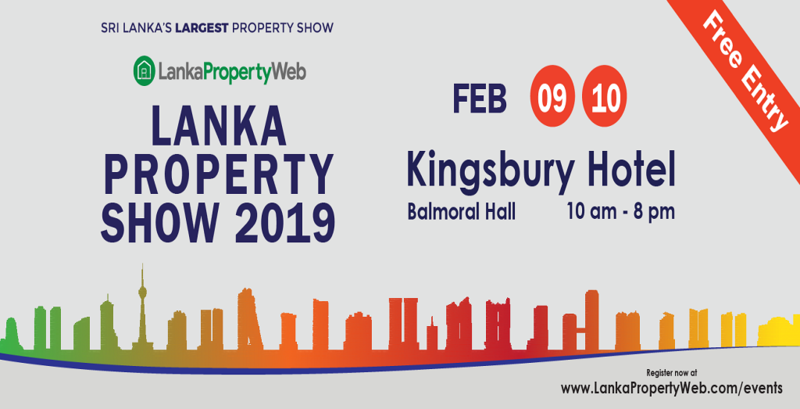 The Lanka Property show 2019 is ideal if you’re interested in joining discussions and having in person conversations about the current state and future of the real estate market. The event is Sri Lanka’s largest property show, attracting the country’s most renowned property developers, real estate agents and banks coming together all under one roof to offer consumers a chance to view, express interest in, and eventually have an opportunity to invest in Sri Lanka’s fast growing real-estate and property sector. This year in addition to the developers showcasing their latest and finest projects, the event will also focus on providing assistance to buyers and sellers with their property needs. LankaPropertyWeb (LPW) in partnership with Nations Trust Bank (NTB), will host a home loans day, where buyers can either obtain to financial health checkup or get a free loan pre-approval for their mortgage. LankaPropertyWeb team will also be at hand to provide guidance and advisory on purchasing property for locals and foreigners. This would be the ideal platform for anyone looking to buy property to find great deals on sale prices and save on the 15% VAT that will be imposed on apartment sales from 1 April. The Property Show thereby aims to bring various projects together under one roof that will benefit both buyers and sellers alike. In addition to the above benefits, some of the banks at the venue will be offering special discounted rates for visitors who takes out a loan during the show. There will be a special bank loan assistance scheme powered by Nations Trust Bank throughout the event for any advice or concerns the participants need to clarify or even to get your loan pre-approved. There will be special rewards and offers in partnership with exhibitors, to buyers that confirm a sale during or through the event. This year’s event will also feature seminars and discussions about property investments, which was a major success with the attendees at the previous events. The show will comprise of panel discussions connected to the market outlook of 2019 and presentations from the developers related to their products and services to give the participants great knowledge and valuable insights. Visitors can also speak with the real estate agents present, so they will be able to better grasp the industry’s traits and assess their investment options more comprehensively. The Lanka Property Show 2019 will undoubtedly be an instrumental platform for real estate professionals and the public alike. With many property developers, exhibitors and buyers all gathered for a mutual purpose, there is an abundance of experts to liaise with and many insightful discussions to be had. Having grown from strength to strength in the last 12 years through its focused vision on offering property buyers and sellers the best service for finding and selling property, has to-date remained the premier property website in Sri Lanka, facilitating numerous dealings since its inception.